You may not realize it, but your iPhone is one of the greatest tools available to help you run your business operations. Times are changing and adaptation is essential for any small business owner. Thousands of apps are available, with thousands more being created daily, which are specifically targeted to business owners – from simple communication services to more complicated accounting apps that allow your office to be able and mobile as you are. All businesses carry out certain functions that are necessary for everyday running. Below are a few critical and functional apps that will help you to carry them out, all on your iPhone. This application will allow you to view documents created using Microsoft Office. It’s impossible to edit or create them with just MS Office, but Documents To Go — Office Suite solves this problem. This app allows the user to create just about any type of documents, whether it’s an Excel file or a brochure created using Publisher. Depending on your needs, you can either choose Documents To-Go – Office Suite or Documents To Go Premium – Office Suite. It also allows the editing and viewing of documents on Dropbox as well as other cloud storage services, and can even open and edit files from a third party app. Dropbox has become the go-to app when it comes to cloud storage. You can save images as well as any document on your phone. These are then backed up on all your devices as well the cloud servers. This app allows you to access your files from anywhere by simply logging in. It also has the added benefit of security; in the event that you lose your phone, you still have access to your files. With Dropbox for iPhone, you can easily share documents with your employees or team members. If you’re planning marketing campaigns or have ideas drawn or written on paper, you can share photos and videos as well through Dropbox. Skype is the ultimate communication tool and, since the introduction of the Skype application for iPhone, you have everything you need to communicate with anyone else who uses this app. Skype is a growing network itself as there are already thousands of users utilizing the services offered. Free voice and video calls as well as IM over WIFI connections make it virtually expense free which is a plus for small businesses that don’t have much in terms of an expense account. You also have the option of using your phone’s 3G network, which would cost whatever your service provider charges for data access. All successful businesses rely on collaboration at times and Asana is the must-have app for keeping a team organized by allowing users to monitor the progress of any projects they are undertaking in real time. For businesses, this can be the difference between achieving your goals and closing shop. The ability to monitor projects allows you to stay organized and Asana nearly eliminates the possibility of missing deadlines. Asana serves as the single place to plan and organize as well as monitor all of your projects on an easy-to-use interface that all members of your team can access. Nothing is more nerve-wracking than tax season and the creators of Expensify know this. Running a small business can be quite challenging, which is why the tax code gives special breaks to such entrepreneurs. Expensify allows you to take a photo of a receipt and customize or categorize your expenses as you see fit. It will then sync those expenses with your tax and accounting software, which basically means that users don’t have to do any of the tedious work. It also has a built-in odometer for tracking mileage expenses. Users can also sync the service with their credit cards and bank in order to keep track of expenses while on the go. Gusto is a cloud-based storage service that allows you to streamline your payroll process. With this finance and payroll management app, you can easily pay your employees or independent contractors through direct deposit or checks. It automatically takes care of all payroll taxes and reporting as well as allowing employees the ability to access pay-stubs and payment history. Along with tracking payments to employees, this app also helps with tracking employees’ vacation and sick days. If you work with independent contractors, Gusto can be used to create a 1099 form. Gusto charges to use its app and is available in three different plans — Core, Complete, and Concierge. You can choose the plan that’s right for your business. Enhance your business’s productivity with the Evernote app. This intuitive reminder app allows you to save notes and images and clip web pages onto your iPhone, allowing you to access everything you’ve saved from any device that’s compatible with Evernote. You can also share notes and other items you’ve saved on Evernote with your employees and business partners. When you’re on the go and have no time to type out your notes, use Evernote’s recorder to keep track of thoughts down without stopping what you’re doing. Plan business trips with Evernote by using its travel-friendly feature that allows you to document itineraries, important travel documents, and more. 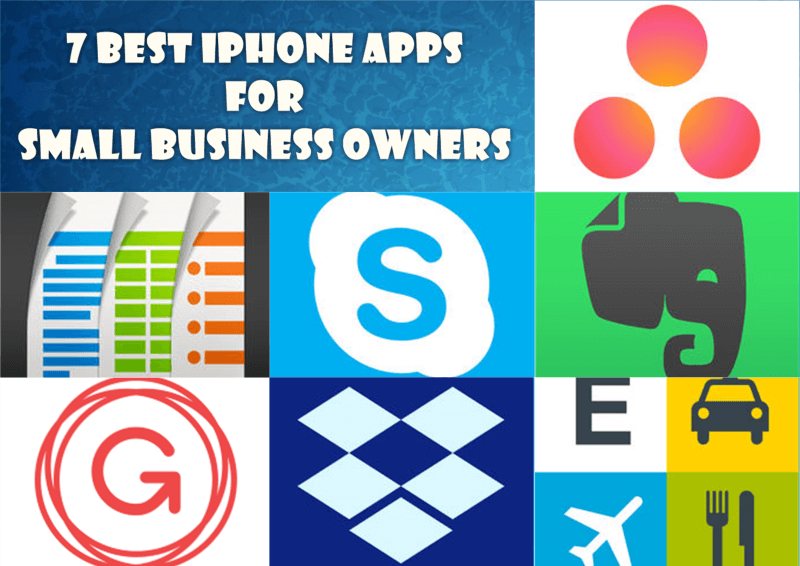 iPhone apps are essential tools for helping small business owners manage their overwhelming workloads. When you’re just starting out, chances are you won’t yet have the funds to hire professional marketers, accountants, and assistants; until you do, let your iPhone do the work for you. Taking advantage of these fantastic applications can reduce your business expenses while allowing you to keep focused on growth.